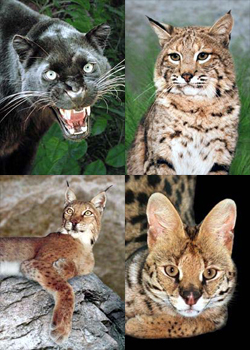 The Wild Cat Education and Conservation Fund is a small non-profit organization (EIN# 68-0481714). Through the generous donations of our supporters, we are able to continue to educate the public about the decreasing population of wild cat species around the world, provide funding for worldwide wild cat conservation projects and offer safe refuge for captive wild cats. CONTRIBUTE AN ITEM ON OUR WISH LIST! SPONSOR YOUR FAVORITE AMBASSADOR CAT! Caring for our ambassador cats is an expensive endeavor. Our constant and ongoing expenses include food for our cats, veterinary services and enclosure upkeep. If you would like to become a sponsor for one of our cats, please take a look at the LIST of CATS we care for here at our compound. A Sponsorship Form can be downloaded and printed out here. You can make a restricted tax-deductible donation that will go directly to the conservation partner of your choice or make a non-restricted donation that will go into the general account. All donations are tax deductible!